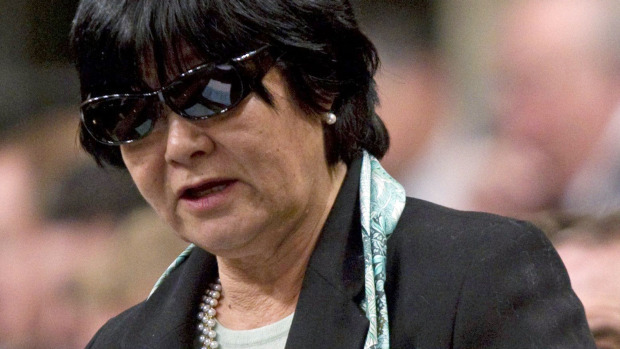 Vodka & Equations: Bev Oda, and Canada's Government. Bev Oda, and Canada's Government. Bev Oda, looking particularly shady. Source. I am irritated, and I'd like to share the reasons with you, my dearest monocled and top-hatted readers (well, that's how I imagine you anyway). Recently, Bev Oda, member of the Parliament of Canada had news break regarding questionable spending of taxpayer funds during a stay in London. It seems that the five star hotel in which she was slated to stay (she was attending a conference being hosted in said hotel) did not suit her. Instead, she decided to stay in the Savoy hotel, a favourite of the rich and famous staying in London. To give an idea of the expense, a stay at the Savoy is $665 a night, and I hear one's morning orange juice costs $16. Further, rather than using a cab, she decided to use a thousand-dollar-a-day limousine service for three days. This is not the problem, however. Frankly, I would be fine with that. The problem is that used taxpayer's money to do so. I am certainly glad that the expenses were discovered and subsequently repaid by Oda. My primary concern is the thought processes that must have been involved in deciding that a) a five-star hotel with car service isn't to your liking, and b) that the taxpayers should pay for you to do so. It's one thing to decline to fund Kairos, but to lie in such a manner is unethical and a breach of public trust. In fact, the investigation pursuant to this triggered a motion of no-confidence in Parliament, and an election. The Conservative Party then won a majority, and continue to govern the country. I would argue it was due to the surge in support for the NDP and a split left-wing vote, but that is neither here nor there. What leads me to borderline hysteria in all this is that the Conservative Party, or "Tories", campaigned on the basis of being an accountable government. After the sponsorship scandal of the Liberal government of the 90s had been unearthed, voters were rightly displeased and wanted what the Tories offered. So now, after being elected on the premise of offering accountable, ethical government, the Tories are acting in a very unethical manner. I know, I heard the scoff. I was talking about Bev Oda, and now I am complaining about the Tories as a whole. Why might that be? Well, news is also trickling out about the purchase of F35 fighter jets. The Tories publicly reported that the purchase would cost $15 billion. Honestly, I support this purchase, and I feel it would be good for the Canadian Forces to have such tools at their disposal. However, the bill for the fighters will come to $25 billion. It is also being gradually revealed that the Tories knew this, and yet downplayed the cost to the House of Commons and thus the public. What else is in the news? The so called "robocalls" scandal. It would seem that a Tory was responsible for automated calling which attempted to mislead electors, sending them to the wrong polling station. The calling list matched the Tories' list of non-supporters. And this comes after the scandal from the election before that in which the Tories used creative accounting via loopholes to funnel money and result in a de facto increase in advertising spending (which, of course, is carefully regulated). Of course, the money was repaid to taxpayers, but only after the votes were tallied. I can only hope that voters have the attention span to remember this when the next election comes around in three years. It will certainly be interesting. NDP support is rising, and they have the benefit of being the only party who have yet to disappoint Canadians. Agreed. I'm still not sure there's any other party capable of leading a country at the moment (granted I've not had adequate time to pay attention to news in 8 months) but the conservatives certainly are not scoring high on the accountability scale. I keep hearing about how the conservatives have helped us weather the recession relatively unscathed, however I think it was you that pointed out it was actually Paul Martin's work that laid this foundation. I don't recall saying Martin's work helped us weather the storm thus far, though there's probably some truth to that statement. The Grits did a lot to reduce the debt through the 90s. I will note, in any case, that Flaherty publicly stated no economic downturn was coming and as such his government would not be providing a stimulus package. That led the opposition parties to threaten to create a coalition government if nothing was done. One prorogued parliament later, Canada's Economic Action Plan was born. I'll also note that the recession isn't really over. Many speculate we may be heading for a "double dip" recession, and a few have brought up the possibility of a depression if things don't start getting better.